WHAT INFORMATION DO WE COLLECT? We ask for your name, telephone number, home address, and email address for competitions, prizedraws, or newsletter sign ups. We may obtain information about your usage of our Website to help us develop and improve it further through online surveys and other requests. WHAT THE DATA WILL BE USED FOR? Your data will enable us, and our processors, to fulfil your quotation request, to notify you about important functionality changes and for statistical or survey purposes to improve this website and our services to you. We may also send you from time to time (by email or post) information about products and services and details of promotions and special offers from Hive Efficiency Group. If you do not wish to be contacted for these purposes, we offer a range of ways in which you can inform us about your marketing preferences: All email messages and email newsletters will contain information on how you can unsubscribe; or send an email to our customer services division on our feedback form writing “unsubscribe” in the subject heading; or Call our customer services division – see the “Contact Us” section; or Write to us at: Customer Services, Hive Efficiency Group, VANCOUVER HOUSE, 111 HAGLEY ROAD, EDGEBASTON, BIRMINGHAM, B15 ALB In assessing your request for goods or services, we may use your information for the purposes of the prevention and detection of fraud. 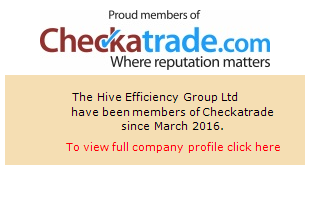 Hive Efficiency Group is a registered data controller under the Data Protection Act 1998 (the “Act”). We comply with the standards, procedures and requirements laid down in the Act to ensure that the personal information you give us is kept secure and processed fairly and lawfully. WHAT INFORMATION DO WE SHARE WITH OTHERS? We may contract with other companies to provide certain services, including credit card processing, shipping, name and address verification, email distribution, market research and promotions management. We provide these companies with only the information they need to perform their services and work closely with them to ensure that your privacy is respected and protected. These companies are prohibited by contract from using this information for their own marketing purposes or from sharing this information with anyone other than Hive Efficiency Group. However, we will not pass your information on to any other third parties for marketing purposes unless you have agreed for us to do so. One of the purposes for which we may disclose your address and post code details is to check against the IMRG Security Alert or any other Fraud Prevention Scheme. We may also disclose specific information upon governmental request, in response to a court order, or when required by law to do so. We may also share information with companies assisting in fraud protection or investigation. We do not provide information to these agencies or companies for marketing or commercial purposes. Say hello to the Hive Efficiency Group.